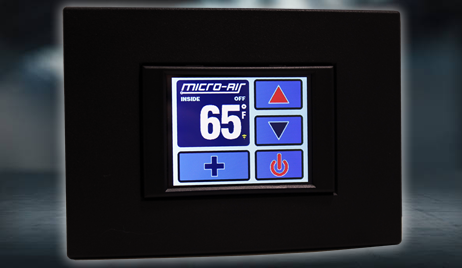 The EasyTouch 8 Pin and 6 Pin Control Display Advantages By Micro-Air, Inc. Check Out The EasyTouch Control Display Advantages! Because at Micro-Air we believe that your boat’s thermostat shouldn’t be dumb. That’s why we came up with this solution that can be controlled from your smartphone* (*8-pin version). The EasyTouch™ Display Control is the marine industry’s newest and most innovative HVAC display control designed with you and your personal comfort in mind. With WIFI capability, an LCD touchscreen, and other up-to-the-minute technologies, we’ve created a control that looks like other modern control displays—but better. Monitor cabin conditions and events that continue to change like temperature, control energy usage and allow for comfort when and where you need it. It supports both the FX-1 and FX-2 families of control boards. 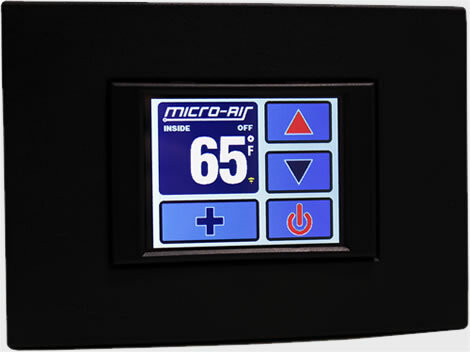 EasyTouch has numerous unique features previously unavailable in any other control display in the marine HVAC industry. "Standard" version automatically works via auto-detection with FX-1 or FX-2 control boards manufactured and sold by Micro-Air. "OEM" version compatible with the 8-pin cabin controls sold by the popular OEM A/C manufacturer, Dometic®. Allows for smartphone control of your A/C. I was in a pickle as my old legacy Marine Air Passport Vector control stopped adjusting temp up or down. Could not find any stock due to age, and of course Marine Air does not make them any more. My service tech suggested this touch screen substitute...it is so simple to operate, and really updates that older marine air conditioner. Out of the box (along with an updated board) and it was working right away. The touch screen is very intuitive to operate...however if you want to get complicated, there is a 44 page manual to explain all the things it does. I am okay with the on-off, raise-lower temp, adjust fan, adjust mode functions LOL.